Polite, welcoming, diverse, peaceful. All words commonly used to describe Canadians. But patriotic? Not so much. 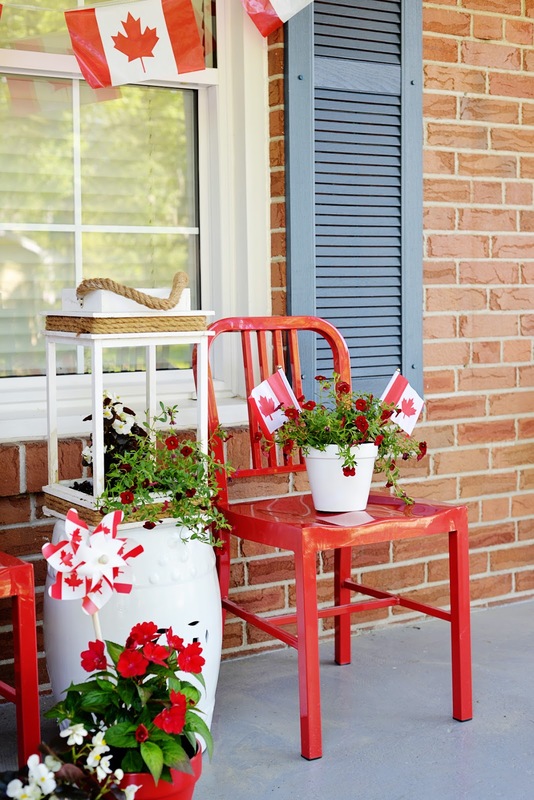 Unlike our neighbours to the south, Canadians seldom exhibit our patriotic spirit outwardly. 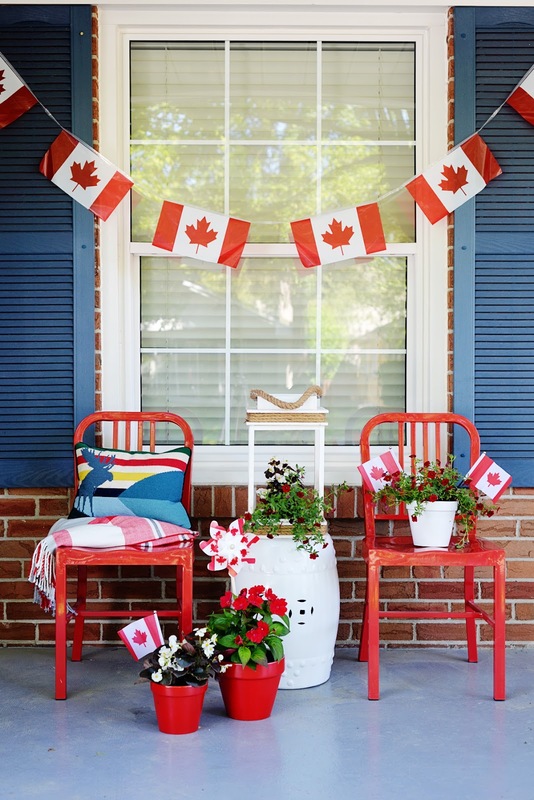 It's rare to see Canadian flags displayed on Canadian porches and homes. Big, vocal displays of national pride just really aren't, well, typically Canadian. That might change this year though. Canada celebrates it's 150th birthday and all across the country, companies, governments, parks and more are prepping for the party. I thought it was high time I wear my maple leaf on my sleeve and put our house in Canada Day mode. 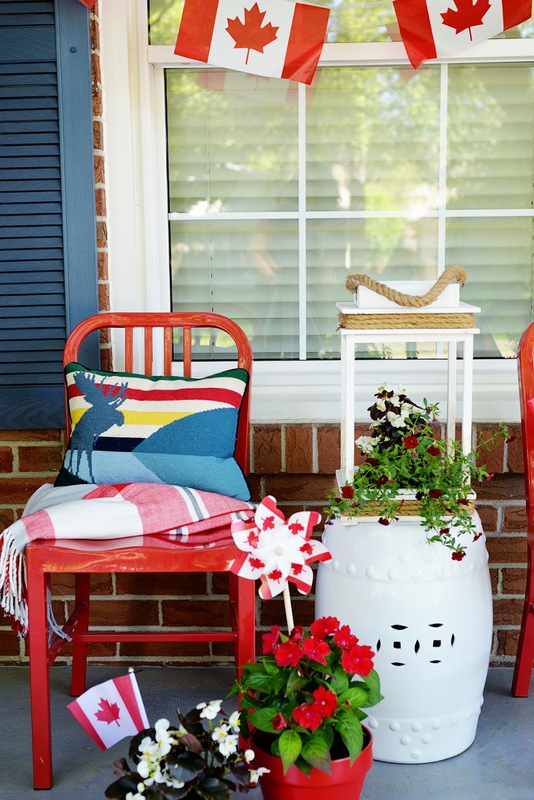 What better way to do that than decking out our porch in red and white. Our favourite craft room red metal chairs made their way outside. An old ceramic garden stool that I recently spray painted white was placed in between and a wooden lantern which I bought at Christmas filled with greenery and ornaments was turned into an impromptu vase. I also grabbed a few clay pots at the dollar store and spray painted them with glossy red and white paint I already had on hand. 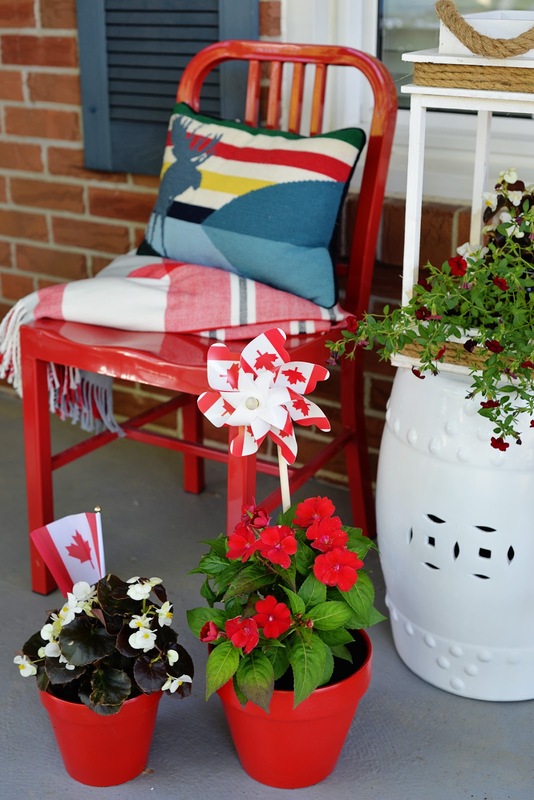 With some red and white flowers from the PC Garden Centre and flags from the dollar store, my porch display was complete. I have to admit, as I was setting up this display, I was feeling a bit self conscious. We're the only house in the neighbourhood with any sort of Canadian decor on display and the curious but friendly looks from the dog walkers and joggers and kids walking home from school confirmed that we're an anomaly. But, I'll take it. Given the state of the world today, there is no other country I want to live in. I am unbelievably proud of Canada's diversity and respect of different cultures, religions, sexual orientation, and gender. I am grateful to live in a non-violent, unarmed society, a country that weIcomes immigrants and refugees. I am thankful for our healthcare system and the unspoken but ingrained belief that we Canadians must take care of one another. That we are different but the same. That we are in this together. I am ready to celebrate all of that. A little red and white decor, I never realized you could be such a powerful reminder. 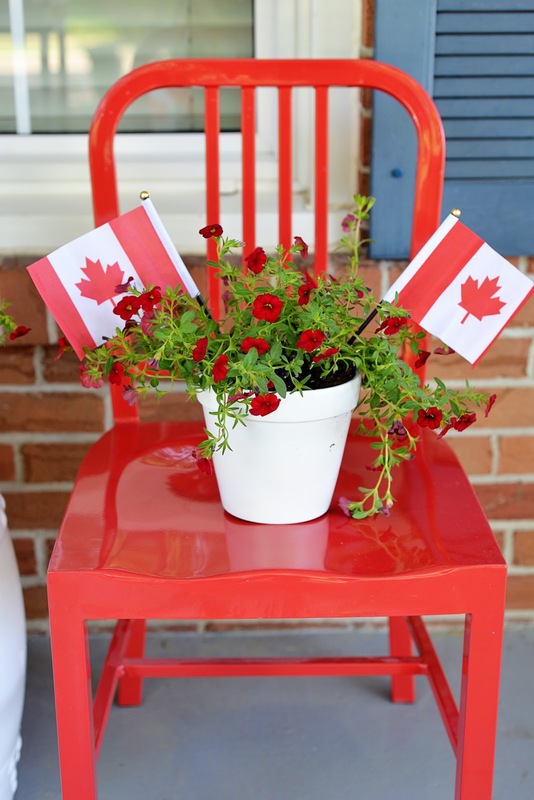 Today, I'm joining with many other Canadian bloggers to showcase different ways to celebrate this great nation of ours. 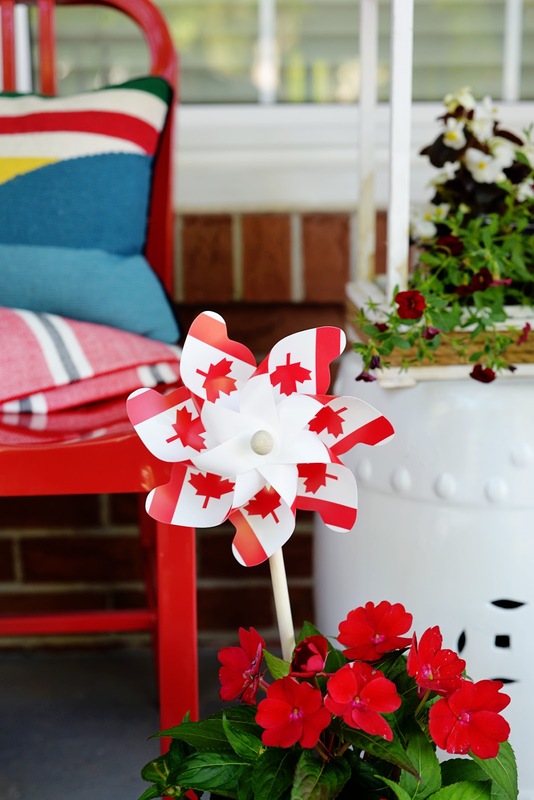 Please visit these links for more Canada Day inspiration. You might find your own red & white pride ignited!